Gail’s first ever yoga session at age 70. Where to start when you are thinking about doing Yoga is understanding that you can do it, even if you can’t do all of it. This mindset can take the pressure off of you from trying to keeping up with the person next to you. Yoga is not a competition and anyone judging a beginner has no place anywhere near a practicing beginner yoga student. They call it a “practice” for a reason don’t they. A bad instructor can walk around and name a strange pose for you to get into that you have never even tried. You don’t know if you should be standing up, squatting, sitting, or lying down? You may be stretching or pulling yourself into a position that hurts when you do it, because you were never shown the proper way to do it. You may need an easier pose that helps you work slowly toward a more difficult pose. A good instructor for beginners will do these things much better than an intermediate or advanced instructor. They will not jump into a class with you among a full room of people that have much more experience and no time to wait around for you. They will guide you with step-by-step instructions, or you can simply stop and watch them do the pose. Then if you think you understand it, give it a try. If it looks too hard, shake your head and wait for the next pose. The instructor will probably see you not moving and help re-explain or guide you into a simpler pose. You can also find your mat neighbor has that pose nailed and you can figure it out by peeking at them as you go. 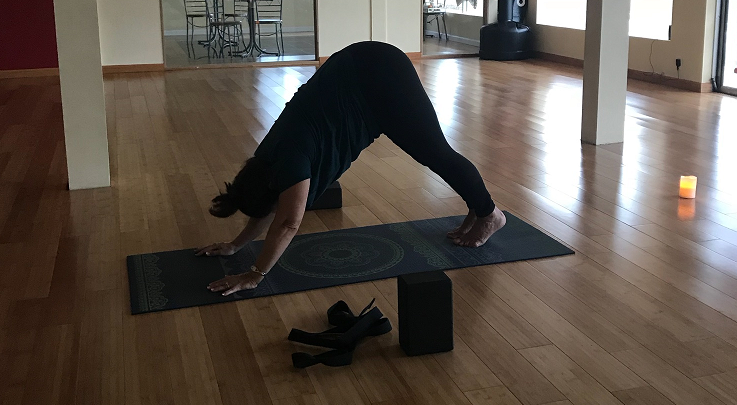 At Salty Souls Yoga we are starting fresh in 2019 with beginners, small class sizes, and personalized instruction so that the incoming students in the 2019 classes can grow together. When the more seasoned class gets stronger in their poses and understanding, they will be challenged with new intermediate classes and poses while the new class of beginners start in at their own class level. If you are ready for more intermediate classes right away, just ask, but if you are a new to yoga, take it slow and enjoy the journey into becoming a better yoga practitioner at your own pace.